Bonnyrigg took another step towards the Super League title with a 3-0 win at Carnoustie Panmure. Rose, who have three games remaining, sit eight poinst ahead of Linlithgow, the Prestonfield men having one game in hand. Bonnyrigg boss David White hailed what turned out to be a comfortable victory. “Once Dean [Brett] scored the opening goal, we were comfortable. Then, when we scored again quickly in the second half, we knew they couldn’t trouble us. Bonnyrigg dominated the opening period but, after a string of missed chances, they only had that Brett goal to show for their efforts. That all changed quickly after the break as Ewan Moyes headed home a Lee Currie free-kick. This was followed quickly by a goal from one of the most talented players in the Super League, Alan Horne, who strode forward before stroking home from 15 yards. Linlithgow are still fighting for the title – thanks to a dramatic 2-1 win at Dundonald. Rose were down to ten men and a goal down after Ruari MacLennan was red-carded but produced a two-goal blast in the last ten minutes to steal all three points and keep the pressure on Bonnyrigg. Linlithgow’s goals came courtesy of an own goal and a fine header from Gary Thom as Dundonald finished the game with nine men. Bo’ness maintained their recent run of good form with a 3-0 win at home to Lochee. Will Snowdon scored again from the spot before second-half goals from Marty Wright and Marc Kelly secured the win. Penicuik were another side in Fife this time to play Kennoway. Kyle Samson gave the visitors the lead before a penalty from Lumbert Kataleza doubled their advantage. Kieran Band pulled a goal back for Kennoway but Penicuik held firm for the points. Broxburn’s poor form continued with a 4-0 defeat away to Camelon but they still maintain their top-four spot. In the Premier League, Fauldhouse look certainties for the play-off spot after beating Bathgate 3-1 while Haddington lost 3-0 at Tranent. 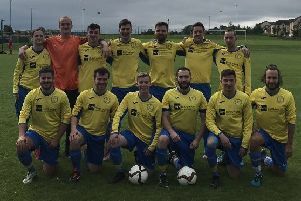 Newtongrange had a comfortable 4-2 win at Thornton Hibs to reach the SMT V Tech Fife & Lothians Cup semi-finals.